NSW Department of Veteran Affairs for their generous support in sponsoring this project. Helen Creasey AM is a Geriatrician at Concord Hospital and a neurologist by training. She has worked with patients experiencing delirium in acute medical/surgical wards, ED and in sub-acute settings such as behavioural management wards for 30 years. Helen has played significant roles in existing dementia research and education in both professional and public settings, as well as in memory clinics. In 2009, she was appointed Order of Australia for services to medicine as a Geriatrician and Neurologist, and through advisory roles with professional and community organisations. In three chapters, Helen gives an overview on the assessment, recognition, diagnosis and management of delirium. These can be watched in one session or broken into three sessions, with discussion following each chapter. 1.1 Why doctors need to know about delirium – relevance, implications, screening and diagnosis. 1.2 Managing delirium in the acute hospital setting. 1.3 Managing delirium-associated behavioural disturbance including evidence base for medication use/withdrawal. Julia has specialised in the health of older people for many years. She developed the Poole’s Algorithm education package, which was supported by evidence and evaluation publications, to guide staff. It assisted with the prioritisation of assessment and management strategies for older people with disturbed behaviour. In 2009, Julia completed a PhD through UTS, in which she examined ways to enable nurses to provide person-centered care for patients with dementia and/or delirium in acute care. A major outcome was the development of a Communication and Care Cues form. It helps families to easily provide staff with personal care information about their family member. Julia continues to strive to improve the whole approach to care of older people and to refute ageist attitudes in general. 2.1 Julia gives an overview of delirium risk assessment, prevention and management in an acute care nursing environment.Focusing on the perspective of patients and nurses, she adopts the principles of person-centered care. Anne Hoolahan has a Grad. Dip. Ap. Sc. (Nursing), Grad. Dip. Hlth. Sc. (Gerontology) and a Master of Education. Anne currently works with Northern Sydney Home Nursing Service as a Community Clinical Nurse Consultant for dementia. She has more than 20 years’ experience working with older people in acute, community and residential care settings. 2.2 Anne describes the approach the community nurse takes in the assessment and management of a person with delirium. She demonstrates how effective communication between the person, the family, the hospital, the GP and community staff is essential for optimum outcomes. The consequences of delirium are significant to both the older person and the health-care system as a whole. 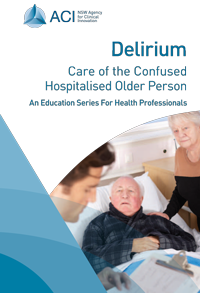 Delirium can cause prolonged hospitalisation, increased mortality (and morbidity or adverse events), development of dementia and risk of admission to a residential aged care facility. Carers for people who experience delirium are often under considerable stress as they try to understand what is happening. Nursing staff also experience stress, which can lead to increased staff turnover. Information about delirium – such as the symptoms, prevention and management – is not commonly available or widely known. Here, three people share their first-hand experiences of caring for a patient experiencing delirium. 3.1 Although Marie’s husband had Parkinson’s disease, she had never heard about delirium before he became unwell and was hospitalised. Marie shares her experience and new knowledge of delirium. 3.2 Sato was a carer for her mother who underwent knee surgery. Her mother was from a non-English speaking background and her English was limited. Her post-operative agitation and confusion was challenging as Sato tried to make the staff realise that this behaviour wasn't "normal". 3.3 Colin's mother presented to hospital with mobility issues, a fractured hip and a history of dementia. Falls were the main issue experienced by his mother, but multiple moves between facilities lead to increasing confusion. Colin believes a lack of appropriate pain management and assessment compounded issues that led to delirium, including hallucinations.